President Donald Trump has announced that the United States will not participate in the planned negotiations with North Korean leader Kim Jong-un. 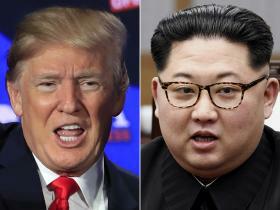 The negotiations were planned for June 12 in Singapore, and would have followed after several meetings between top American and North Korean officials. Mr Trump’s decision to pull back from the talks cited “tremendous anger and open hostility displayed” in a recent statement from North Korean officials. That statement appears to have been one in which a senior North Korean official dismissed remarks from Vice President Mike Pence as “stupid”, and said that the country would not “beg” for discussions while warning of a “nuclear showdown” if diplomacy failed. Mr Trump had previously said that North Korea “may end up like Libya”, where then-leader Muammar Gaddafi was killed in 2011 by rebels abandoning nuclear weapons eight years earlier. You can read Mr Trump’s letter, in full, below.